There are several shopping malls in East London, but only one is targeted at shoppers with cash to splash. We're generally not that rich over here, at least in comparison to the other side of town. Even Westfield provides a toned down retail offering at Stratford City compared to Shepherds Bush, which has its own luxury enclave called The Village. Ilford would never support a premium handbag shop, while Hackney's designer offering is limited to outlet stores. But there is one anomalous outpost of wealth out east, the financial centre at Canary Wharf, so it's only right they have a shopping mall in which employees can spend their bonuses. It's called Jubilee Place, and it just got bigger. 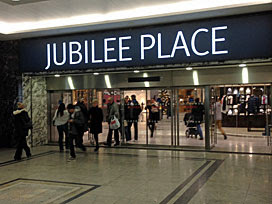 Jubilee Place opened ten years ago, the second shopping mall at Canary Wharf. 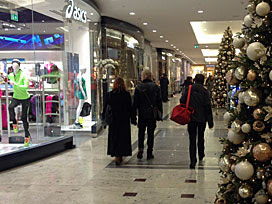 The first sits under the main tower, a lengthy subterranean arcade leading from Cabot Square down to Waitrose. It's got some upmarket shops, but also much more ordinary fare like JD Sports and a Carphone Warehouse. It's somewhere for financial service workers to shop at lunchtimes, and for more affluent locals to go at weekends. Jubilee Place runs parallel, on the opposite side of the Jubilee line station, beneath Jubilee Park. See what they did with the branding there? Jubilee Place has a relatively exclusive feel. Nothing so over the top as might be found in Mayfair, this isn't the Bond Street of E14. But there are fragrance boutiques and ladieswear collections for browsing, plus several food outlets aimed more at sit-down dining than desktop takeaway. The supermarket is an M&S Simply Food, which is always a good way of spending extra on calories. Stores sell high-class cashmere for protection against the air-conditioned office, and tailoring for City gents who aren't based in the City. Only a branch of Boots lowers the tone slightly, but hey, what self-respecting futures analyst wouldn't need a chemist on their doorstep? The new extension to Jubilee Place is on Level Minus Two. That's one floor below the main mall and two floors below the park, on the same level as the Underground station ticket hall. This used to be nowhere special. You walked in from the tube via two sets of heavy doors (still present) to face a small newsagents selling papers and sweets. A short escalator then led up to a mezzanine, and up again to the the glazed atrium at the heart of the main mall. That's now changed. The newsagent's long gone, his corner replaced by several artisan-style shops. And the direct escalator's no longer there either, forcing everyone to walk further past lots more shops before ascending. A marble mall has been created, with swish lighting, glazed shop frontages and bijou display cases containing goodies you might like to purchase. One mosaic on the floor commemorates London as "the world's only open market for tortoise shell", as if this were somehow a good thing. And all the time security guards watch, just in case something less than perfect might occur. Jubilee Place's brand new shops increase the upmarket factor somewhat. Monica Vinader sells contemporary celebrity-endorsed jewellery. Orlebar Brown sells not swimming trunks but "resortwear". There's lingerie, fitness gear, exclusive homeware and posh tights. The only food option is Le Pain Quotidien, for when a sandwich won't do and you need "elegant boulangerie fare made with organic ingredients". The anchor tenant is Banana Republic, located at the end of the mall, making its first appearance east of the City. There's even a boutique selling ballet shoes, hardly an East End staple. Now you might be thinking, excellent, that's just what I need. You might live or work in Docklands, and this might save you an annoying trip into town. Indeed I'm not going to moan or complain about this new development, merely shine a spotlight on its existence. But read on. The estate's owners have long encouraged those with disposable income to shop here, making available various free publications in each mall. Us plebs pick up The Wharf newspaper to read about Tinchy Stryder's roots and Asda's new community space. Those with bonuses to spend pick up Canary Wharf magazine, a glossy full colour freebie which this month reaches its 100th edition. Think gold-embossed cover, think adverts for jewellery and motors, think fashion spreads for business travellers. Page 32 lists nine November basics for fashion conscious men, including a £300 pair of trousers, a £448 hoodie and a £595 jumper. The cheapest watch pictured on page 57 costs £1360. Page 107 showcases Harrods' Decadence Hamper, a Christmas steal for £20,000. Or maybe you'd like a three bedroom flat on the 41st floor across the docks, assuming you have £2¼ million to spare. Tower Hamlets is one of the most divided boroughs in the country, with a vast gulf between those who live here and those who work here. Only 15% of jobs in the borough are taken by local residents, with the others filled by people commuting in. Those who work in Tower Hamlets have an average salary of £58,000, whereas the median household income for those who live here is only £29,550. Indeed nearly 20% of households live on less than £15,000 a year, while 49% of children in Tower Hamlets live in poverty – the highest rate in the UK. Here some of the most deprived wards in London nuzzle up against some of the richest, and not enough of Docklands' financial muscle trickles into the surrounding communities. If you ever fancy a sharp contrast, start at Chrisp Street Market on Poplar's Lansbury Estate, and see what they have in the way of fashion, jewellery and fine dining. From here it's just three stops on the DLR, or five stops on the bus, to the underground shopping malls at Canary Wharf. There are no pawnbrokers here, no 99p stores, no fried chicken shops, and what's easily affordable in one place costs more than a month's income in the other. Twas ever thus, we've always been a divided society. But a visit to Jubilee Place might well remind you on which side of the divide you belong.